Find out how to choose high-quality tap & die sets, hand tools popular with mechanics and woodworkers. Considerations include size, type of tap, brand and use. Tap and die sets are cutting tools designed to create screw threads in solid material. The tap will cut the female portion, or nut, while the die cuts the male portion, or the bolt. Tap and die sets come in many sizes and there is a great deal of variance in the quality you can expect from brand to brand. The problem with inferior sets is they lack the power to cut through many metal alloys, particularly stainless steel. If you work with a tap and die set professionally, choosing a high-quality set made in the United States will avoid digg and drilling out a busted tap, welding the hole back into the material, re-drilling and re-tapping. Taping a weld is much more difficult. Here's a look at the process of buying a good tap & die set and what to look for in a high-quality set of hand tools. What is the Tap and Die? Taper taps, which have a tapered design to make it easy to use on a hole with no threads at all. These taps are used with a a T-shaped handle and used to create blind holes. Plug taps, which are the most common type of tap and the most versatile. Also used to create blind holes, the plug tap will usually have 3-5 tapered threads and may be used instead of a taper tap. With a sharp taper at one end, this tap is a good choice for cutting deep threads with only a few turns. Bottoming taps do not have a taper and will tap to the bottom of the blind hole to securely keep a bolt in place. Start by deciding which of these three taps you'll need for the job. You can recognize each by sight. A plug tape has tapered cutting edges and is designed to begin and properly align threads. Bottoming taps have no taper and are designed to extend threads all the way to the bottom of a blind hole. They aren't made to start threads. A taper tap gives you a more gradual cut into the material and designed for use in situations that may cause most taps to break. Taper taps are a good choice if you're working with alloyed steel or small taps. Are Inexpensive Tap and Die Tools a Good Idea? Cheaper tool sets may work well enough for general use at home but they are not intended for professional use. If you're using an inexpensive tap and die set as a mechanic, expect to run into a great deal of problems. Normal and budget taps tend to have very inferior handles that cause breakage. They are simply not designed for regular or industrial use. 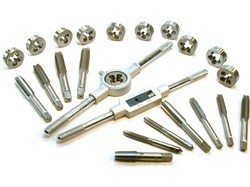 For a reliable set of tap & die tools, avoid retail stores and choose industrial tool suppliers. The absolute most important thing to look for in a tap and die set is quality. This can not be emphasized enough. There are a few types of metals the tools may be made from, including carbon steel and HSS. Carbon steel tends to be the most affordable, but not the best in the long run. HSS, or high speed steel, hand tools are the best option for durability. American brands tend to produce the best quality, most durable taps and dies, so check into where your tools are made before you buy. Finally, check the tool set for the sizes you'll need for your job. A good set will be available in either metric or SAE sizes, which mainly have automotive purposes. Tap & Die hand tools from Bovidix are made from the highest quality metal in the United States. Bovidix tools are designed to last a lifetime and made from professional and industrial use. Their new Multibox technology offers a completely new way to store and transport your tools with a patented design that efficient, space-saving and durable. People at the lower end of the economic ladder keep their cars longer and do extreme makeovers to keep them running.